Andy Pafko was a solid player in his day. Maybe not a superstar, but dependable. But Pafko does have a major claim to fame within the hobby, playing a key role in one of the most important sets produced. 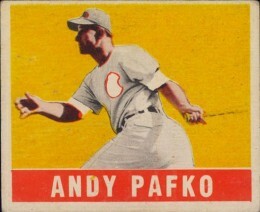 As a result, Andy Pafko cards have a special place with many collectors. The five-time All-Star's career spanned 17 seasons. During that time he player for three teams: the Chicago Cubs (1943-1951), the Brooklyn Dodgers (1951-1952) and the Milwaukee Braves (1953-1959). He was a member of the Braves' World Series Championship winning team in 1957. Well liked by fans and teammates, Pafko's hard-nosed play and blue-collar work ethic helped ensure a lengthy career. He finished with a .285 lifetime batting average, 213 home runs and 976 runs batted in. Andy Pafko passed away October 8, 2013, at the age of 92. Andy Pafko's place in hobby lore isn't centered on his career statistics. Instead, Pafko has the distinction of having one of the most difficult cards from the 1950s to find in high-grade condition. He is card #1 in 1952 Topps Baseball. It has caused vintage set builders and set registry participants to go on extended wild goose chases trying to track it down in decent shape. 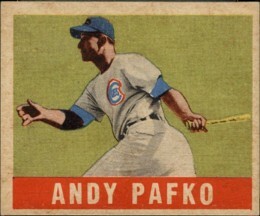 While the first card from all vintage sets of the 1950s and 1960s can be a challenge to find in high-grade condition, the 1952 Topps Andy Pafko card tops the list. Numbers don't lie. So when you mention 1952 Topps to a vintage dealer or set collector, they may not think Mickey Mantle right away. Instead, it could be, "The #&^% Andy Pafko card." While there may be some frustration from some, it's a sign of respect. You can click on the tabs above, for information on Andy Pafko rookie cards, view a cardboard career gallery as well as learning about his signature habits and pricing. 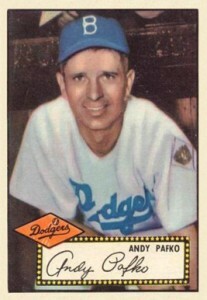 Andy Pafko's rookie card hails from 1948-49 Leaf Baseball. Not too many players can say they are part of vintage set checklists that included Babe Ruth and Mickey Mantle but Pafko is an exception. His Leaf card #125 is available in two versions. Besides the regular versions, there is a color variation that most likely was the result of a printing press running out of ink. Andy Pafko's autograph managed to stay fairly consistent over his career, both on the diamond and on the autograph circuit. Popular with fans and collectors, Pafko was one of the only surviving members of the last Chicago Cubs team to appear in a World Series (1945). As such, he was a tremendously popular autograph nationally, but at Chicago area shows in particular. Very affordable, authentic Andy Pafko signed items can be found for under $50. Below you will find an example of what an authentic Andy Pafko autograph looks like. This can be used as a first point of reference for determining the legitimacy of autograph memorabilia, but is not a substitute for having your items authenticated by a well-respected professional autograph authentication company. Some of the trusted sources within the sports memorabilia market for authenticated Andy Pafko autographs include the following companies: PSA, JSA, Upper Deck, Jim & Steves and Mounted Memories. Click on any of the images below to view full size photos. 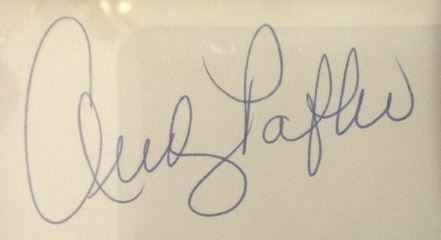 The letter "n" is unique, almost resembling two letter "e's"
The letter "k" flows out of the letter "f"
2002 Topps 1952 Reprints Andy Pafko AUTOGRAPH Yankees RARE! !